Item Description: Inlay accents, fluted details and an oil-rubbed effect on the rich stain give this chairside end table such great character. 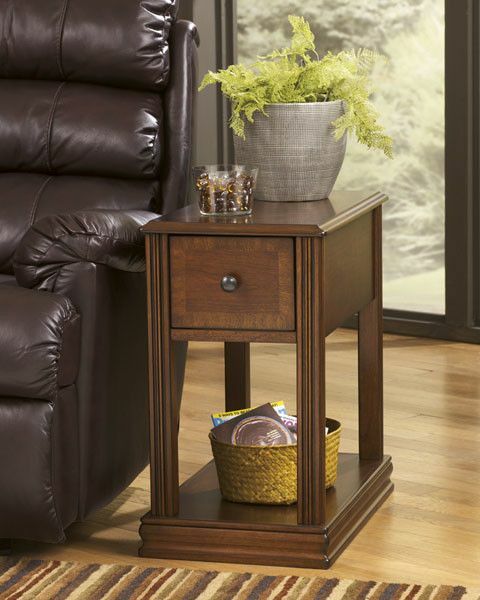 The base shelf is just the place for a storage basket, decorative vase or other accent piece. We love the deep drawer with removable tray offering handy storage. 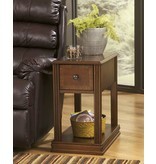 Series Features: Different variety of chairside end tables. Colors range from medium brown to almost black. T007-319 made with oak veneer and hardwood solids. T007-371 made with birch veneer and hardwood solids. T007-430 made with oak veneer and hardwood solids. T007-527 made with cherry veneer and hardwood solids. T007-158 made with birch veneer and hardwood solids with a faux marble print table top with gloss polyurethane finish.